Henriksson, L., Frodeson, S., Berghel, J., Andersson, S., and Ohlson, M. (2019). "Bioresources for sustainable pellet production in Zambia: Twelve biomasses pelletized at different moisture contents," BioRes. 14(2), 2550-2575. The fuel from biomass is increasing due to the transition away from fossil fuels. The use of biomass as fuel varies geographically. In Africa, biomass is used mainly as firewood and charcoal (Janssen 2012). In Lusaka, Zambia, 85% of urban households use charcoal and the estimated consumption per household per year is 1.3 tons of charcoal (Gumbo et al. 2013). To produce this amount of charcoal, 8 tons of wood are needed (Gumbo et al. 2013). The teardown of wood for the production of charcoal leads to deforestation, which in Zambia has been estimated to be between 250,000 and 300,000 hectares per year and is one of the ten highest deforestation rates in the world (Matakala et al. 2015). The total annual consumption of wood for biofuel in Zambia is nearly 14 million tons, of which annual charcoal production uses 6 million tons (Ryan et al. 2016). Charcoal production begins with the harvesting of biomass. Logs are then covered and burned in primitive charcoal piles, where up to 70% to 90% (Pennise et al. 2001; Janssen 2012) of the energy is lost. The combustion of the charcoal often occurs in stoves with an efficiency rate of approximately 12% to 27% (Bhattacharya and Abdulsalam 2002). According to the World Health Organisation (WHO), the indoor air pollution from particulate matter and carbon monoxide associated with these conventional cooking methods causes 4.5 million premature deaths every year, which is more than malaria, HIV/AIDS, and tuberculosis combined (WHO 2016). Overall, the use of biomass in Zambia is both inefficient and unhealthy. This situation, along with an increasing population and energy need, is clearly not sustainable. One step towards a sustainable solution is to use a cooking method that does not use charcoal and does not generate poisonous gases. Today, it is possible to cook food and generate heat from pellet stoves specifically designed for cooking; such pellet cook stoves are capable of optimal combustion (Bhattacharya and Abdulsalam 2002; Peša 2017; Souza et al. 2017). However, even if the pellet cook stove can solve the problems associated with human health through optimal combustion, pellets must be available. By pelletizing biomass, it is more economical to transport it due to the higher density and uniform size of the product, which also makes it easier to dose (McKendry 2002; Näslund 2003; Nielsen et al. 2009a; Stelte et al.2011; Castellano et al. 2015). The density of pellets is especially important when they are used in pellet cookstoves because a sufficient amount of energy must be generated for the food being prepared. However, to solve the problems with deforestation it is important that biomasses for pellet production are based on available waste and biomasses not used today. For countries where deforestation is an issue, a broad and variable raw material base becomes a must for sustainable energy production. However, one prerequisite for pellet production today is that the pellet producers must strive for a feedstock with a chemical composition that is as constant as possible (Frodeson et al. 2018). Furthermore, the knowledge relationship between densification and chemical composition is limited (Ramírez-Gómez 2016). This lack of knowledge and the need to strive towards equal chemical composition limits the possibilities for the sustainable utilization of all available raw materials. The most limiting step for a variable raw material base for a pellet producer is when the pressure from the roller wheel, hereinafter referred to as Proller, compresses the biomass through the die channels. This step can be divided into three sub processes: compression, flow, and friction (Nielsen 2009). For all three sub processes there are several parameters of importance: the chemical composition, moisture content (MC), and particle size of the biomass (Nielsen 2009). The friction is important for two reasons: i) to generate the right temperature, so that strong bonds can be generated within the pellets; and ii) to create a backpressure sufficient to build up Proller (Nielsen 2009; Frodeson et al. 2018). The variable Proller is usually between 210 MPa and 450 MPa (Nielsen et al. 2009b; Seki et al. 2013), and the die temperature often reaches 100 °C to 130 °C (Nielsen et al. 2009a). The die channel length can be divided into two parts, an active part where friction occurs and an inactive part that is needed to ensure that there is enough thickness of the die for mechanical strength. The length of the active part of the channels is chosen based on a specific material. This means that for a specific die, the length must be adjusted so that the backpressure does not exceed the Proller limit (Holm et al.2007). This could facilitate pellet production and counteract corresponding problems, such as die blocking and high-energy costs during production (Pastre 2002). One way to avoid die blocking is by purposely adding water to act as a lubricant in the die. Water also affects the possibilities of generating strong bonds in the pellets (Kaliyan and Vance Moray 2009). However, adding the right amount of water is important. The optimal moisture content (MC) has been determined to be 5% to 10% when pressing pellets from woody materials and 10% to 15% from grass (Stelte et al. 2012). In addition to water, the chemical composition of the biomass also affects the densification process (Frodeson et al. 2018). The chemical composition varies between biomasses and there are mainly four different types of biomass: woody plants, herbaceous plants/grasses, manures, and aquatic plants (McKendry 2002). Of these four, woody plants and herbaceous plants/grasses are best suited as raw materials for solid biofuel due to their lower MC (McKendry 2002). The chemical composition of the biomass consists of different proportions of lignin, polysaccharides (cellulose, hemicellulose, and others), proteins, extractives, and ash (Frodeson et al. 2018). Wood consists of tightly bonded fibers compared to herbaceous biomass that has more loosely bonded fibers, indicating a lower proportion of lignin that binds the cellulose fibers (Castellano et al. 2015). Studies show that woody biomass yields harder pellets than herbaceous and grassy biomass, probably due to the higher amounts of lignin and lower amounts of extractives present (Stelte et al. 2011; Castellano et al. 2015). However, it is also determined that lignin is not necessary to produce high quality pellets, as pure cellulose can yield pellets with the required properties (Frodeson et al. 2018). Extractives are considered to create weak boundary layers in pellets, which can cause them to break more easily (Stelte et al. 2011; Castellano et al. 2015). Extractives also have a lubricating effect. This can reduce friction in the active part of the press channel, which can reduce the energy demand and lower the temperature (Stelte et al. 2011; Castellano et al. 2015). Because different chemical components have different impacts on the pelleting process, it is important to have knowledge of both compositions in addition to their ability to be pelletized as single sources as well as in mixtures. Several studies have evaluated and tested biomasses common in Zambia, such as bamboo (Poppens et al. 2013; Liu et al. 2016), cassava (Lockenus 2014; Zhu et al. 2015), eucalyptus (Almeida et al. 2012; Castellano et al. 2015), peanut shell (Fasina 2008; Stasiak et al. 2015; Bai et al. 2017), African pine (Castellano et al. 2015; Andersson 2017), pigeon pea, and sicklebush (Andersson 2017). Even if there are a number of studies, most of them are based on one or a few numbers of biomasses, meaning that it is difficult to evaluate them against each other. There is also a lack of knowledge on how pellets from these materials are affected by storage. The storage of the pellets can be challenging, especially in areas where air humidity is high and shifting (Demirbas 2002). Zambia has a tropical climate with three different seasons: dry and cold, dry and warm, and wet and hot (CIA 2018). Shifting humidity can cause breakage of pellets and affect the amount of energy obtained by combustion (Demirbas 2002; Hartley and Wood 2008; Thek and Obernberger 2010). Therefore, when evaluating biomasses as raw materials for pellet production in Zambia, moisture uptake is an important quality parameter to measure. Beyond moisture uptake, the compression and maximum generated backpressure are also important parameters to evaluate. However, to investigate small quantities of biomasses for pellet production, it is advantageous to use a single pellet press. A single pellet press is also an easy way to predict different behavior in different materials (Holm et al. 2011) and to predict trends in pellet mechanical properties when evaluating biomass (Mišljenović et al. 2016). The pellet cook stove could be a solution to the problems with deforestation and health risks related to food cooking in Zambia. An important parameter is to find a solution for pellet production as a sustainable utilization of the biomasses. Such a solution could be to gather and collect different biomass wastes and produce pellets in a pellet plant. However, there is a lack of information on how different types of biomasses available in Zambia affect densification. This limits the possibilities of using a varied biomass waste stream for pellet production. The aim of this study was to increase knowledge on how twelve waste biomasses, available in Zambia, would serve as a raw material base in a pellet production facility. One objective was to investigate the work for compression, friction, and maximum backpressure during pelletization produced at different MC levels, as well as the pellets’ solid density, hardness, and moisture uptake. Another objective was to investigate their availability and suitability as raw materials in general. The methods used for the materials are divided into a literature-based background description of each material, its properties, and its chemical composition. The tested materials are then presented, followed by a description of the method for the laboratory study for evaluation of the mechanical properties of the tested materials. The tested materials were bamboo, cassava peel, cassava stem, eucalyptus, Gliricidia, peanut shell, Lantana camara, miombo seed capsules, pigeon pea, pine, sicklebush, and Tephrosia. A general background on the materials is briefly described and the chemical composition based on the literature are summarized in Table 1. Bamboo is a group within the grass family (Roskov et al. 2014) and occurs naturally in tropical, subtropical, and temperate areas (Bystriakova et al. 2004; Kelchner 2013). The majority of species are lignified and woody, but some are herbaceous; both types can be found in Zambia (Kelchner 2013). Zambia is one of four countries that has the highest diversity of woody bamboo in Africa (Bystriakova et al. 2004). Bamboo grows wild among pine plantations in the Copperbelt Province, Zambia. It is considered to have low value for construction and manufacturing. Many bamboo products are domestically used and can be important in both household and local economies (Bystriakova et al. 2004). It is an important plant for stabilizing soil, has a rapid growth, and can mature in 3 years to 5 years after the cultivation period and is, therefore, thought to be able to help reclaim deforested land through plantation (Akwada and Akinlabi 2018). Bamboo is perishable after harvest, requiring preservation methods and short supply chains (Poppens et al. 2013). Its properties as a material vary between growing sites and seasons, and it is difficult to harvest mechanically (Poppens et al. 2013). Cassava, or Manihot esculenta, also known as “manioc,” can grow up to 5-m-high and is grown mainly for its starch-rich root, which is a basic food ingredient in many countries in Asia, Africa, and Central and South America (Reinhardt et al. 2013). In 2016, 1 million tons of cassava root were produced in Zambia (FAO 2017). It has been estimated that 80% of the peel waste from this cassava root could be used for pellet production (Kemausuor et al. 2014). The stems and branches can be as much as 50% of the root mass (Zhu et al. 2015). The stems and branches are wasted after harvest (Zhu et al. 2015), and this surplus is often cleared from fields in readiness for the next season’s growth and are abandoned or burned in the wild, causing emissions and environmental problems (Zhu et al. 2015). Eucalyptus spp. belongs to the family of myrtle plants (Roskov et al. 2014). Eucalyptus species, also known as “blue gum,” are 25-m- to 50-m-tall evergreen trees (Rejmánek and Richardson 2011), often planted in Mediterranean and tropical countries because they are fast growing and lucrative (Ducousso et al. 2012). South Africa is highly dependent on plantations of exotic forest species, especially eucalyptus (Rejmánek and Richardson 2011; Ducousso et al. 2012), which is becoming the most frequently planted genus in Africa (Ducousso et al. 2012). Some species, including Eucalyptus grandis, are considered invasive (Anonymous 2018). Its water consumption is also a concern, especially in countries where water availability is limited (Farley et al. 2005; Albaugh et al. 2013). For use as biomass, blue gum wood may be available after three years (Rejmánek and Richardson 2011). E. grandis is known to have more impermeable characteristics than other woods (Jankowsky and Santos 2005). Sawdust from Eucalyptus spp. is a residual that is available in some Zambian sawmills. Gliricidia spp. belongs to the family of pea plants (Roskov et al. 2014). Gliricidia sepium is one of the most common trees in the northern parts of southern Africa, Mexico, and Central America (National Research Council 1980). It is a fast-growing hardwood tree that can grow up to 15-m-high (National Research Council 1980). It has nitrogen-fixing properties and can be rotated with other plants to prevent soil degradation (Akinnifesi et al. 2006; Montero-Solís et al. 2017). G. sepium has high propagation, initial growth, and biomass exchange, as well as having the ability to be chopped after harvest (National Research Council 1980; Fuwape and Akindele 1997). It is also an important tree forage crop due to its high nutritive value, with protein comprising approximately 21% of the tops and dry matter (Man and Wiktorsson 2002). G. sepium has poisonous roots, bark, leaves, and seeds, and has shown great potential against plant parasites (Aragón-García et al. 2008; Adekunle 2009). Gliricidia is grown in the eastern province in Zambia to prevent soil degradation and to improve agriculture. Its twigs and trims are waste that can be collected, but in relatively small amounts. Lantana camara is a species within the verbena family (Roskov et al. 2014). This poisonous shrub mostly originates from Central and South America, although some species are believed to originate from Africa and India (Parsons et al. 2001). It has been widely distributed in approximately 60 countries throughout the tropic, sub-tropic, and warm temperate regions of the world (Parsons et al. 2001). L. camara is one of the world’s top 100 most invasive species and was the first weed to be placed under biological control (Parsons et al. 2001; Patel 2011). In South Africa, L. camara was placed under biological control in the 1960s, but without success, causing huge economic and ecological issues (Baars and Neser 1999). L. camara is a favored firewood plant but its disadvantage is that it has a short/fast burning time (Tabuti et al. 2003). It can be used as a biomass in the manufacturing of paper, but is difficult to harvest and, therefore, is considered uneconomical (Kuhad et al. 2010). Miombo is the vernacular word for the genus Brachystegia (Roskov et al. 2014). Brachystegia spiciformis is the most extensive species of Brachystegia in savanna woodland, covering much of central and southern Africa including Zambia (Mtambanengwe and Kirchmann 1995). However, miombo woodland is threatened by conversion to agriculture and miombo is being used for charcoal or wood fuel, which can damage biodiversity and ecosystems if it is not regulated (Mtambanengwe and Kirchmann 1995). It is a deciduous tree with a flat crown that can be 8-m- to 20-m-high. Fruits are flat pods/seed capsules, usually 90-mm-long, but occasionally up to 140 mm (Dharani 2011). Mature seed capsules fall to the ground and become available as biomass. Peanut, or Arachis hypogaea L., also called groundnut, is a member of the family Leguminosae (Nwokolo 1996). The peanut is not a true nut, but rather a legume much like beans or peas (Nwokolo 1996). It is a major crop in the tropical, subtropical, and warm-tempered areas of Asia, Africa, Oceania, North America, and Europe (Heuzé et al. 2017). The peanut shell is a major part of the industrial waste of peanut producing countries (Heuzé et al. 2017). In 2016, nearly 160,000 tons of peanuts were produced in Zambia (FAO 2017), whereof the nut is approximately 71% to 79% of the weight and the remainder is shell (Hamm et al. 2018). Shane et al. (2016) estimated that 53,000 tons of peanut shell waste is available in Zambia. The pigeon pea, or Cajanus cajan, belongs to the legume family (Roskov et al. 2014). It is a food crop that has been cultivated for a long time in Africa and Asia and is a common crop in the tropical and sub-tropical regions (Odeny 2007; FAO 2017). The majority of today’s production comes from India (Odeny 2007; FAO 2017). It can grow up to 3.6-m-high, has edible protein-rich peas, improves soil, can withstand drought, and can grow on nutrient-poor soils (Anonymous 2005). It has been evaluated to be an important crop with great potential for success in Africa, and its production hardly requires any external input (Odeny 2007; FAO 2017). The stems and stalks are woody, and approximately 2 tons of stalks are available per hectare during each growing season (Samanta et al. 2013). The genus Pinus of the Pinaceae family contains approximately 90 species (Roskov et al. 2014). They are often dominant components of the vegetation over large parts of the northern hemisphere (Richardson 1998). Pinus spp. has been cultivated in many countries in the Southern hemisphere and it forms the foundation of exotic forestry. The most important species in the South African forest industry is Pinus patula, which is also one of the most problematic invasive species alongside Pinus pinaster and P. radiata (Moran et al. 1999; Anonymous 2018). The invasive species cause problems, such as reducing the drainage of water from mountains, reduction of pastures, and posing of fire hazards, which threaten the survival of domestic plants (Moran et al. 1999; Anonymous 2018). Zambian sawmills are a source for pine sawdust, usually including a small proportion of pine bark from when the logs are sawn. Sicklebush, or Dichrostachys cinerea, is a legume in the Fabaceae family. It originates from Africa and is currently found in countries along the equator (Roskov et al. 2014). Sicklebush is a hardwood bush with edible fruits and seeds and can be up to 7-m-high (Pedroso and Kaltschmitt 2012; Fernández et al. 2015). It has rather small dimensions that make it unsuitable as a construction timber and often used as fuel or fencing (Roskov et al. 2014). It has nitrogen-fixing properties and can be used to control erosion in soil (Pedroso and Kaltschmitt 2012; Fernández et al. 2015). Sicklebush can easily become invasive (Pedroso and Kaltschmitt 2012; Fernández et al. 2015). The genus Tephrosia consists of 345 different species in the Fabaceae family (Roskov et al. 2014). It originated in Africa, but it now exists, for example, in South America, India, and other countries along the equator (Orwa et al. 2009). It is an annual or perennial tree or shrub with woody or soft herbaceous branches (Orwa et al. 2009). Primarily small-scale and low-income farmers, who cannot afford synthetic pesticides to counter pests when storing crops (Kamanula et al. 2010), use Tephrosia vogelii as a pesticide plant. T. vogelii is poisonous and planted as a hedge around fields in Zambia to keep cattle from crops (Orwa et al. 2009). The stalks and branches can be used as fuel and can be cut often (Orwa et al. 2009). It also enriches the soil quality through nitrogen fixation and acts as a green field cover (Kamanula et al. 2010). Tephrosia candida has been found to provide approximately 10 tons of dry matter per hectare (Odedire and Babayemi 2007). 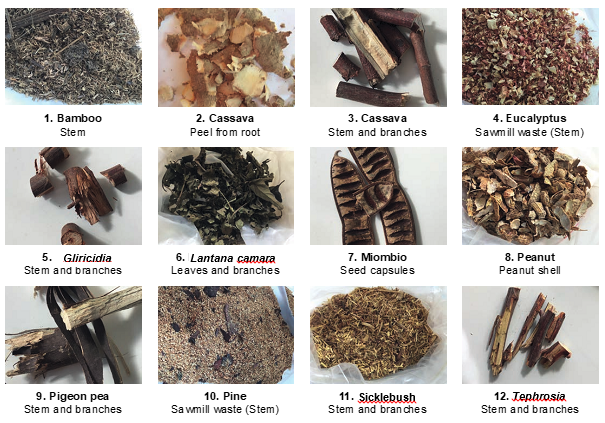 The tested materials were 1) Bamboo (Bamb), 2) Cassava peel (CasP), 3) Cassava stem (CasS), 4) Eucalyptus (Euca), 5) Gliricidia (Glir), 6) Lantana camara (Lant), 7) Miombo seed capsules (Miom), 8) Peanut shell (PeaS), 9) Pigeon pea (PigP), 10) Pine (Pine), 11) Sicklebush (Sick), and 12) Tephrosia (Teph) (see Fig. 1). All materials were evaluated at three different MCs, 5%, 7.5%, and 10% (wet basis), for a total of 36 test series. Some of the materials were delivered as sawdust and others as bark or stem. The bark, stem, and branches were first sawn, in a Bosch (GCM 8 SJL; Stuttgart, Germany), to sawdust, and all materials were ground in a Culatti Mikro Hammer Mill (DFH 48; Limmatstrasse, Zurich, Switzerland) with a sieve size of 2 mm to attain uniform particle sizes. The method for moistening was that all materials were placed in 45 °C for 48 h to ensure that the materials had equal starting positions. After the MC (%) was measured according to SS-EN 14774-1 (2009) on a wet basis, each test material was divided into three equal parts; water was added to correspond to 5.0%, 7.5%, and 10.0%. The method for moistening the material has been described in earlier work (Frodeson et al. 2018). The materials were sealed in plastic bags and stored for 24 h before conducting any tests. Pellets were produced in a single pellet unit located at the Department of Environmental and Energy Systems at Karlstad University (Karlstad, Sweden). The press was a 137-mm high and 120 mm wide steel cylinder with an 8.2-mm cylinder bore within which an 8.0-mm piston compressed the biomass against a removable bottom plate. The temperature of the steel cylinder was controlled with two heating coils, and was set at 100 °C. After equilibration, a 10-mm-long steel piston plug was placed in the bottom of the die hole to allow for a longer distance to measure friction. A 13-mm-long nylon plug was then fitted before a 1 g sample of the test material was added into the die. Finally, a 13-mm-long nylon plug was placed above the sample. The nylon plugs ensured that the temperature at both ends of the pellets was equal. The samples were compressed by the piston at a velocity of 30 mm/min, to a desired pressure of 14 kN. After a retention time of 10 s at full pressure, the piston ejected the pellets out just after the bottom plate was removed and the steel plug fell out from the die hole. The single pellet press and the method for producing pellets has been described in more detail by Frodeson et al. (2018). Five pellets were produced for each test series. After pelletizing, each pellet was directly cooled down to ambient room temperature using a small fan, and then stored in a closed plastic bag at the same temperature for further tests and analyses. During the densification, the force was logged three times per second. The compression and friction work were calculated by integrating the force and time determined from the logged data by using numerical integration trapezoid method. The compression step was determined over the time it took to increase the force from 1 kN to 14 kN. The friction work was determined over a total distance of 20 mm and started when the force reached 0.5 kN. For booth compression and friction, the piston speed was constant, (30 mm/min). The compression and friction work were depicted as Wcomp (J) and Wfric (J), respectively. The maximum friction force needed for the piston to press out the pellet was read as the highest value generated in the process. This value, depicted as Fmax (kN), represented the maximal potential backpressure. The pellets produced were analyzed through measuring the pellet’s solid density (g/cm3); first, by sanding the ends of the pellets, and then by measuring their volume and weight. The pellet hardness (kg) was measured using a KAHL motor-driven hardness tester (K3175-0011; KAHL, Reinbek, Germany). All of the results are presented as the average value of five pellets. The pellet parts that were left after the hardness test were used for the moisture uptake test. Before moisture uptake testing, the pellets were dried in 50 °C air for 24 h and then stored in a climate test chamber (C+10/200; Clima Temperatur Systeme Gmbh (CTS), Hechingen, Germany) at 30 °C and 90% relative humidity (RH) until equilibrium was reached. The weight of the pellets was tested before they were placed in the climate test chamber, measured every hour for the first 8 h, and then periodically measured afterwards to determine when the equilibrium was reached. During the preparation of the biomasses, prior to as well as after the densification, some distinctive properties of each biomaterial were noted. Bamb had a smell of soil; CasS had a spongy middle; Euca was reddish with a typical woody smell; Glir was hard and woody; Lant was dark green and had a strong scent of herb; Pine was orange with a typical woody smell; Teph was yellow and created a notable amount of dust while being ground; Miom made less dust during grinding compared to all of the other biomasses; Bamb had intact particles and the pellets were grassy and softer; PeaS like Bamb crumbled easily at the ends; and Teph made shiny smooth pellets. Table 2 shows a compilation of the data for all of the materials collected in connection with the single pellet study. The energy needed for compression, Wcomp, is shown in Fig. 2. Of all tested materials, pine required the highest Wcomp, followed by Euca, Glir, and Bamb. Both CasP and CasS generated the lowest Wcomp. According to the results in Fig. 2, the woods (red and blue colored) had a higher Wcomp compared to the herbaceous biomasses (green and brown colored); only Sicklebush and Teph had the same level Wcomp as the herbaceous biomasses. The fact that Euca, Glir, and Bamb generated higher Wcomp can be explained by the presence of xylan within the hemicellulose. In a newly published study by Frodeson et al. (2018), xylan is identified as a component that affects the densification process and can explain the difference during the pelletizing of hardwood versus softwood (Frodeson et al. 2018). Gliricidia sepium is a hardwood tree (National Resource Council 1980) and xylan is the main component in the hemicellulose for both bamboo and eucalyptus (Maekawa 1976; Patt et al. 2006). Xylan together with glucomannan, which both are polysaccharides, are the two most common biomass hemicellulose components (Fengel and Wegener 1989). However, there is a deviation between them because xylan has many more side groups connected to the functional groups compared to glucomannan (Fengel and Wegener 1989). No or few side groups means that the polysaccharide is rather linear or stiff, whereas numerous side groups means that it is rather flexible or highly branched (Fengel and Wegener 1989). Thus, the particles have a greater degree of elasticity and more work is required to press them together (Frodeson et al. 2018). However, this did not explain why pine had the highest value of Wcomp. Table 2. Data From Moisture Content, Work for Compression, Friction, and Maximum Force During Densification of the Pellets, and Pellet Density and Hardness. Standard deviation was used for calculation the error. Unlike hardwoods with high amounts of xylan, pine hemicellulose is mainly glucomannan, which has been shown to generate a low Wcomp (Frodeson et al. 2018). As shown in Table 1, pine has the highest level of lignin, and lignin has been shown to generate a high Wcomp (Frodeson et al. 2018). In the same study, pine was distinguished as being the wood that had the lowest value of Wcomp. Although it is likely that there is a difference between pelletizing African pine and Scots pine from Scandinavia, more studies have to be conducted to support this statement. Fig. 2. Compression work, Wcomp from 1 kN to 14 kN for all tested materials at different MC. The lines between the dots do not describe the regression or the inclination, the lines should be seen as help for the reader to follow the materials trends. Fig. 3. Maximal backpressure, Fmax at different MCs, for all tested materials. The lines between the dots do not describe the regression or the inclination, the lines should be seen as help for the reader to follow the materials trends. To generate Proller, the material has to cause a Fmax, which is the static friction that can hold against Proller in the active part of the die channel. As shown in Fig. 3, the highest generated Fmax in this study was generated by CasP at 8% MC, with Bamb as the second highest followed by Euca. However, Bamb and Euca both had a high Fmax for all tested MCs and seemed rather independent of increased levels of moisture in comparison to CasP, which increased greatly with an increased MC (Fig. 3). Furthermore, CasS and Teph slightly increased in Fmaxwith increased MC, while Glir and Lant slightly decreased. The Fmax of the other materials seemed unaffected by the increased MC (Fig. 3). As shown in Fig. 3, all of the woody biomasses had a high Fmax at a low MC in comparison with the herbaceous biomasses. When the MC increased, this difference between woody-based and herbaceous biomaterials levelled out in Glir and Lant. The CasP had a higher MC and, therefore, Bamb and Euca should be pelletized with shorter press lengths. The independent behavior in Fmax versus MC for Eucalyptus, miombo, peanut shell, pigeon pea, and sicklebush meant that they could be combined in raw material mixtures for pellet production. This, due to the rather wide optimum for MC for such a mix, will simplify the production properties. The energy required to overcome friction, Wfric, is shown in Fig. 4, where Bamb and Euca presented the highest Wfric. The lowest Wfric was registered when pelletizing CasS and PeaS (Fig. 4).